As of this past weekend, I have, now, given all of my Christmas gifts. (Yes, the holidays did stretch out well beyond December, for me.) The feedback that I received, post-Christmas, consisted of some pretty good reviews. When giving hand-crafted gifts, I choose recipients who I am confident will appreciate receiving hand-crafted items because they either never craft anything, or they do some crafting, and so understand the work involved. So, that said, here are some of the comments that I received. From a recipient of spa items -- "wow, you made this?" This individual was particularly delighted with receiving items that I had made, and specifically so, because they were beauty items. A long conversation followed, about how to make a variety of things. And my second-hand information was that she was very impressed with the packaging of the items. I bring this up because Valentine's day is just around the corner and a sweet little envelope, made from a sheet of a favorite love poem, could contain a handwritten note or card, or homemade treats, to someone special, for very little cost. Another gift recipient was blown away that you can actually make soap, easily. I explained how melt and pour soap is combined with extra ingredients, then poured into a mold. Most of the people to whom I give hand-crafted soap have no idea that melt and pour soap base exists. So it's always exciting to see their face or hear their voice when they realize that I made the soap. That makes it worth it. My hand-knit dish cloths were also well-received. This recipient happens to be the person who taught me how to knit, in the first place. So she could appreciate my progress in knitting, as well as the beauty of the pattern used. I hope they give her many years of good service. 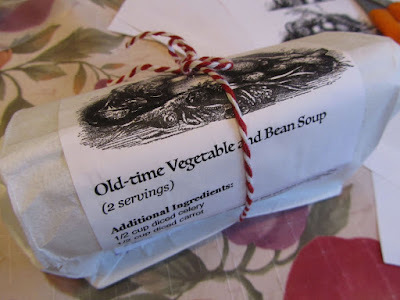 The stand-out comment that I received on the homemade soup mixes was again, about the packaging. Several people in the room commented on how the packaging looked like something they might see in Williams-Sonoma, possibly due to the coloring (red/white twine, combined with black/white label). In any case, I took that as quite a compliment. 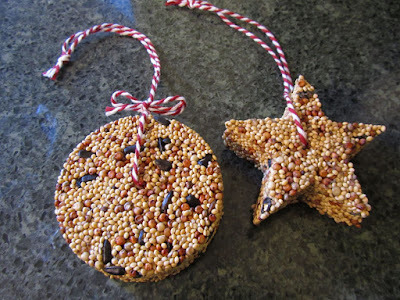 I received good feedback from two of the recipients of the birdseed ornaments. Again, the families to whom I sent these were impressed that they could be made at home. And finally, the "display soap". At the very end of the holiday season, I needed a couple more hand-crafted items. So, I made a small batch of molded soaps for two different recipients. The comments that I received cracked me up, on these. Upon receiving, the wife repeatedly said they were too beautiful to use. And I kept reassuring her that they should be used. A week later, the husband told me that they had put the soaps "on display". I just imagined the conversation in their home when that happened, because I recall similar "discussions" and "instructions" in my own home, growing up. You know, when you have fancy soap in the house, someone is the self-appointed "guest soap monitor". As a kid, we weren't supposed to use the guest soap in the guest bathroom. If we really needed to use the guest bathroom (which we were discouraged from doing, but sometimes is a necessity), we were often followed to the bathroom door by my mother, as she would shout out instructions through the guest bathroom door to "don't use the guest soap! That's for company! Use the soap in a dish under the sink." We'd oblige, inferring how important this must be to my mother, as why else would she interrupt some important work in the kitchen to inform us to keep this guest soap pristine. So, the "display soap". I did tell our friends to please, use this soap. I can always make more. It really isn't a piece of art, but something to be used. I hope they have all gotten over this feeling like they need to keep the soap pristine. I'll find out when I visit their home, someday. I've thought of a twist on this gift, just for these folks, a soap-of-the-month gift, where I deliver a new and different bar of guest soap to them, every month, for the year. Maybe that would take the need-to-save-this-forever thinking out of receiving the soap. Hmm, maybe that could be a retail gift package -- the soap-of-the-month club. 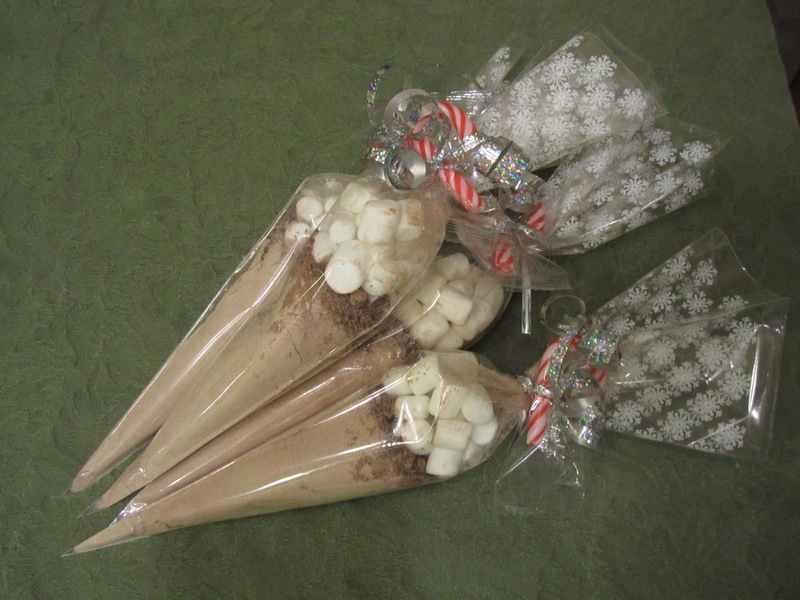 What was my takeaway from my hand-crafted gifts this year? Presentation seemed to really matter. Maybe I have a lot of shallow friends and family. From the product, itself, to the wraps and packaging, how it appeared was the first impression. The other takeaway for me, if I were to seek employment in retail production, I might really enjoy working in the design of packaging. There's no doubt about it, your packaging is beautiful. It also sounds like you thought carefully about who you gave your various handcrafted items to. 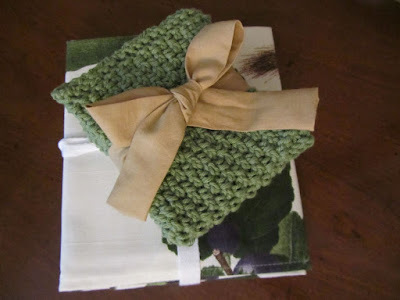 More than once I have received really nice handmade gifts that I just can't use. I know I shouldn't, but then I always feel a bit guilty that the person spent all of that time on them and I don't use them. Perhaps it's because my handcrafted items are small gift, but as the giver, I have the opposite feeling. I feel that if they don't use them, that's okay. I just hope they give it to someone else who can use it. With one bar of soap, that I gave to someone who is more of an acquaintance, (but I wanted to thank her for things she'd done for me), I did tell her that if she couldn't use it, to donate it to a women's shelter, and I wouldn't feel badly that she couldn't use it. Perhaps at some point, you pass those gifts on, and then they are of use to someone else. I think you can still appreciate the love and time that someone put into making a gift, without using it yourself. I don't know if that helps you feel less guilty, though, because feelings are feelings. I hope your week is off to a great start, live and learn! Everything turned out so lovely! Great job in making such well-received gifts for so little! I had to chuckle at the display soaps, as we had some rose-shaped "display" ones growing up. 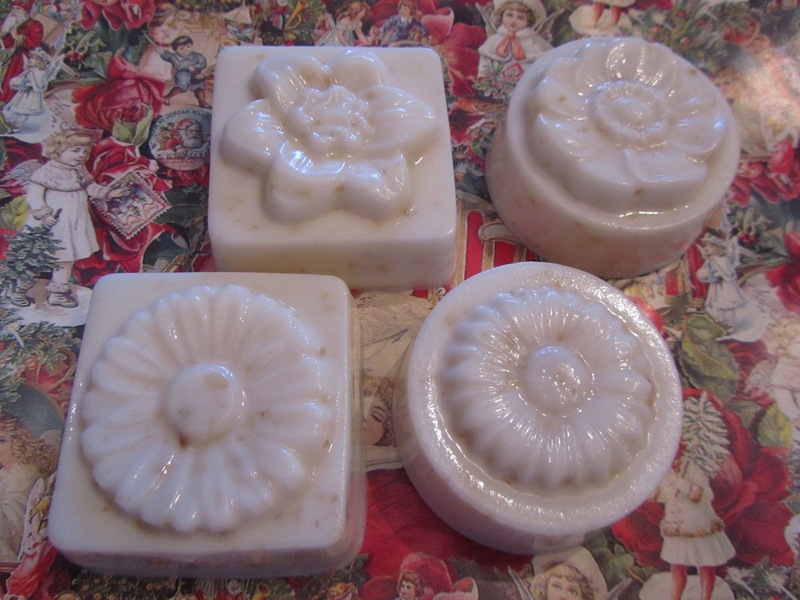 those are what we had, too, rose-shaped soaps. Especially as a kid, we did not understand having soap that is not for using. My sister and I traded weeks with the dusting of the house, and I remember having to dust the soap! I agree that you have the keen ability to transform the mundane into exquisite. And you have analyzed the who what when where of the situation to make it a success. I definitely think you would do well in product development. Just looking at all the products you have made as gifts is impressive. I don't think I could make one worthwhile givable thing that would be appreciated. I think I'm too practical to make anything presentable (yet I love making things). I don't want to burden anyone with something they don't appreciate like Live and Learn said. However, that is not true of you, in light of all your positive reviews, your gifts were truly appreciated. Or else, I have very polite recipients on my list! You underestimate your abilities, YHF. Part of it is identifying the right person to give a handcrafted item to. There are people in my family that I have learned to not give anything handmade, as they don't appreciate it as much as others. I'm okay with that. I hope your day is off to a great start, YHF! It's early there! Have you not gone to sleep, or just up in the night, or up very early? I tried making the bird ornament for our cockatiel, but it didn't turn out well, as often the case with me. I can follow a recipe yet not have the same success. I think the gelatin I made was too thick and gooey, perhaps not following your tutorial exactly where you mentioned heating it to boiling (I didnt). He picked at it once, and never went back. It usually takes a few days before he takes to something new, so after a few days, I removed it from his cage. Well, thank you always for your positive replies. It brightens my day!! This is my usual sleep pattern, after four hours, I get up for a few hours, then get sleepy and don't wake up until about 8 am. Hmm, I wonder why he wasn't interested in eating it? The one I hung outside attracted wrens, lots and lots of wrens. It took a few days. When some of the birds would pick at the ornament, seeds would fall to the ground and another 6-8 birds would be on the ground eating those seeds. It also attracted a squirrel! I'm sorry yours didn't work out well. My father woke up, in the night for about 2 hours, every night, for years. He would get up and read mail and newspapers. Then after a couple of hours, he'd go back to sleep. He could also take naps during the day, easily. I can't nap, unless I'm sick. If I wake up around 4 or so, then I just get up for the day. If it's still 3-something, I try to just lay there, in hopes of falling back to sleep. Every once it a while, it doesn't work and I wind up having a very, very long day. I hope you get sleepy again, soon! What a treat to see your homemade gifts again. They are all so beautiful, and looking at them, I can almost see the love and patience that you have oozed into each item, Truly wonderful. And what a lovely start to my day. Thank you! Thank you! Everybody has their favorite part of the holidays. One of mine is making gifts. Okay, so that's a different take on receiving a gift, having it sitting out to enjoy, visually, for a little while. Maybe that's what my friends are doing. Thanks for sharing that. My kids made your birdseed ornaments. They turned out really cute! A gingerbread man, a cowboy hat, a heart & several stars. Oh those sound cute! And I hope your kids had a great time making them. Maybe the birds will be back soon. I hope your day is off to a wonderful start, Melissa! Where did you get the molds for your "display" soaps? You've motivated me to get some gifts made! And if you use a 50% off coupon, the mold is about $1.75. If I remember correctly, I used about 3.75 to 4 ounces of soap base per bar. I tell you that, so you can calculate how much a small bar (the round or square, the rectangle would use more soap base) will cost to make. I receive Michael's coupons in my email, and if I happen to be going near a store, while a high value coupon is in issue, I pick up one supply at a time, at half off, like one week I may buy the block of soap, the next the mold, another, some beeswax, etc. I keep my gift-crafting cupboard stocked so I can make gifts inexpensively. Thank you! 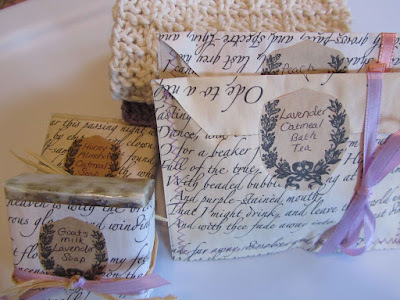 Oh, you were the "gift soap monitor" in your home? That's funny, and sweet! You just wanted everything to be nice for guests. That's very sweet and I can just imagine you as a young girl. Have a lovely day, Ushuaia!